I promised to be quick. Here we are: version 0.95 is ready. Now I have 4 rows on layer5 for the remote-functions - this is triggering 64 samples or whatever and should be enough for the most things I do live. Also I included the "dubdialer". The 5th row on layer5 on the tenori-on is now sending controller messages, and the value can be set on the dialer itself - great for dubs ! After the concert I began working on a new version, which also enables me to use the tenori-on also as a remote control for Ableton Live. Here is my version 0.94. This is only work in progress, but you can control samples now in the gate-mode and there are some basic remote-functions. 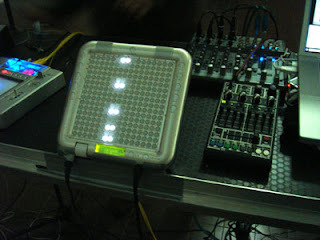 Yesterday was my first live-concert with the tenori-on. I used the Fadervox for controlling Ableton Live and with the Tenori-On and my "tenori-on helper" I programmed a few sequences on the spot and played some solos in the solo-mode. Everything went well and I am glad that I can adjust the synchronisation of the Midi-clock! I am using different midi-controller for a long time now. 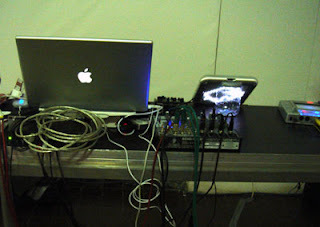 Even in the "Pre-Midi" era I played a kind of weird controller called "The Digitarre" (The Digi-Guitar), which was controlling a huge digital sequencer. I normally play Donald Buchlas "Thunder" and "Lightning II" as my Midi-controllers I am very much into sequencing and Midi-controller, so decided to buy the Tenori-On in London. First of all, its a great machine. It is such fun to play it! 1.The way blocks can be copied and arranged is very easy. Put it would also be very helpful, if there would be a possibilty to automate the arrangement of the blocks, to create songs. I also would like a kind of arranger very much. And: It also would make perfect sense, if I could stack some of the blocks together, to create longer patterns. 2. The tenori-On puts out Midi-Notes. The velocity is always 100. To control external synthesizers it would be great to give the possibilty to assign a layer to different mode, like sending controller. I made a small program in MAX/MSP, which I will describe later on. 3.To use the Tenori-On as a tool for a DAW, the Midi-clock is not useable, because of two reasons: First it is a Midi-Clock and not a Midi-timecode, which makes it a little unstable, and second, it has a delay. I tried it on different computer-systems with 3 different Midi-Interfaces and the Midi-Clock has a delay between 50 and 65ms in tempo 120 in master, as well as in slave-mode. This is not usable for using the Tenori-on as a programmer for sequences in DAWs. But I also found a workaround. 4. 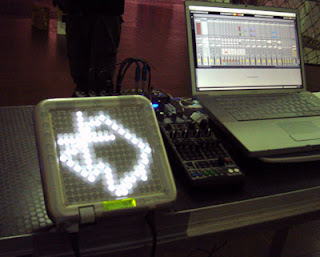 It is not really handy and possible to use the tenori-on as a controller for Ableton Live. Because of the Midi-Out situation it coul only provide 16 Midi-Notes on each Layer, and also not very flexible - I have to think about a patch with Max/Msp. I wrote this MAX/MSP-patch called the "tenori-on helper" and i gave it the version-number 0.9, because I finished it today, and I am not sure if everything is working without mistakes. 1. You can adjust to Midi-Clock in ms to your DAW, the only thing is, that you tenori-on has to start on the second beat - then everything works in sync - adjustable for each Midi-Channel. If you are not familiar with the tenori-on - here you can find the official videos from Yamaha. This blog is about the tenori-on, the new instrument from yamaha. "Media artist Toshio Iwai and Yamaha have collaborated to design a new digital musical instrument for the 21st century, TENORI-ON. A 16x16 matrix of LED switches allows everyone to play music intuitively, creating a "visible music" interface." I am one of the happy early users and would like to use it for my favourite DAW "Ableton Live". The problem is, that the tenori-on is giving only midi-notes as the output - so I have to write a patch with Max/Msp to use it.